The use of small-calibre projectiles for deer control has always been a hot potato here in the British Isles. There are shooters very definitely for them and those vehemently against their use. Since the legalisation of .22 centrefires for small species of deer in England, such as muntjac and Chinese water deer (but not roe), the debate has increased. The Scots already know the effectiveness of .22 centrefires for roe as it is legal to use these rifles for this species north of the Border. Thinking about it logically, the reason that .22 centrefires get bad press for deer work is that in the vast majority of cases the wrong bullet type and weight rather than the wrong calibre are used. The .22 centrefire holds a niche as a superb vermin and fox rifle, which excels with fast-moving and highly frangible bullets designed to expand quickly on thin skinned quarry to cause an instant kill. If, however, these bullets are used on a larger species such as a roebuck, that small speeding bullet is less likely to penetrate the vital organs for a humane kill and will cause unacceptable surface wounds. This is for heart and lung shots, but head or neck shots are a different kettle of fish. If deer are the primary target, you need a heavier, more controlled expanding bullet that penetrates the vital cavity and avoids unnecessary meat damage. To test this I used three rifles with different velocities, so that I could see each bullet?s performances at the lower and upper ends of the velocity scale. I chose a .223 Remington as a good all-rounder medium-velocity cartridge case, both in an RPA barrel with 1-in-9 rifling twist and a 1-in-12 twist Contender carbine. The bullets before and after expansion: (l-r) Sierra 55-grain GameKing, Nosler 60-grain Partition, Barnes 62-grain TSX, Winchester 64-grain soft nose, Sierra 65-grain GameKing fired at low and high velocity, Speer 70-grain and Swift 75-grain Scirocco fired at low and high velocity. In this way bullet stability in differing twist-rates could also be analysed. For the faster velocity rounds I used my trusty RPA rifle with a 1-in-8 twist barrel chambered in my Wildcat round, the .22 Satan. This is a necked-down 6mm Swiss Match case that I developed five years ago, specifically to shoot heavier .22 calibre bullets. I chose seven representative bullet types that are readily available. These included, in weight order, Sierra 55-grain GameKing, Nosler 60-grain Partition, Barnes 62-grain TSX, Winchester 64-grain soft nose, Sierra 65-grain GameKing, Speer 70-grain and finally Swift 75-grain Scirocco bullet. Their diverse designs would prove interesting throughout the tests. The expanded bullets seen from above: (l-r) Sierra 55-grain GameKing, Nosler 60-grain Partition, Barnes 62-grain TSX, Winchester 64-grain soft nose, Sierra 65-grain GameKing fired at low and high velocity, Speer 70-grain and Swift 75-grain Scirocco fired at low and high velocity. To gain relevant results I used the Bullet Test Tube, which is a green, dense, waxy material held in a 6in-diameter tube that, when shot, replicates animal tissue very well and is handy for measuring bullet expansion. The only problem is that it?s expensive and after one shot and the data has been gathered, you have to melt it down and reset it, which takes nearly 24 hours. 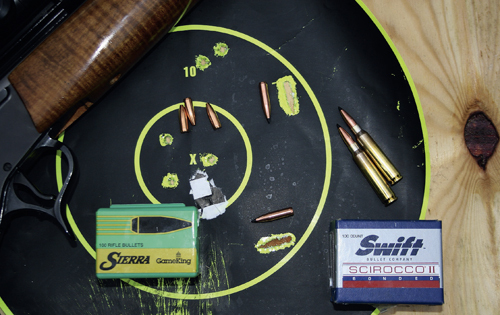 The tests proved some bullets are better than others for use on deer-sized game. The control bullet, the 40-grain Norma, though a spectacular fox or vermin load, proves why light, fast, small calibres should not be used on deer (the minimum legal weight is 50 grains). There was little initial penetration before the bullet exploded into fragments in the wax, which is great for vermin, but it is doubtful whether it would penetrate a deer sufficiently. Penetration of the bullet test tube: (clockwise from top left) Nosler 60-grain Partition, 55-grain GameKing, 65-grain GameKing and Norma 40-grain V-Max control bullet. The Sierra 55-grain is a GameKing bullet, but with a hollowpoint that is stable in the 1-in-12 twist with a velocity of 2,993fps. This penetrated 1in before the bullet started to expand and only penetrated 4.5in in total. 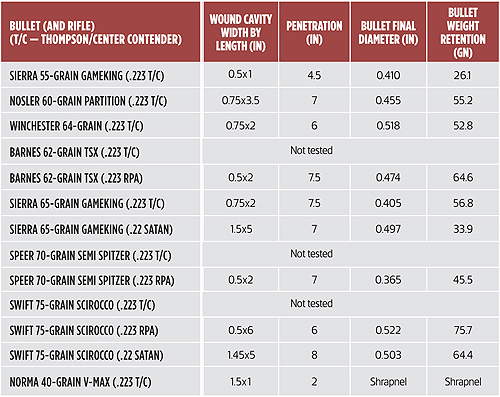 It expanded too quickly and the retained bullet weight of 26.1 grains indicated that the bullet fragmented. The 60-grain Nosler Partitions are designed as a controlled expanding bullet and at a velocity of 2,944fps from the 1-in-12 twist .223 Thompson/Centre Contender (T/C) barrel showed no flight instability and had a final weight of 55.2 grains. Penetration of the bullet test tube: (top to bottom) Nosler 60-grain Partition and a Norma 40-grain V-Max varmint bullet. There was an initial 0.75in of penetration and then a 0.75in-wide and 3.5in-long wound cavity with a total penetration of 7in. Therefore, the bullet penetrated well, expanded very well from .224 to 0.455in and thus would transfer its retained energy to the vitals of small deer. The Barnes is a solid copper bullet unlike the other copper-jacketed and lead-core bullets tested. It showed superb weight retention, in fact it was heavier than its initial weight due to test media imbedded in it. At 2,964fps it was stable in the faster RPA 1-in-9 twist barrel, but produced a 0.5in-wide by 2in-long wound cavity and penetrated more than 7.5in in total with a final bullet diameter of 0.474in. This was an accurate, solid-hitting projectile unlikely to cause much initial venison damage. Winchester produces a 64-grain soft nose. It is a pretty standard bullet that gave a velocity of 2,846fps from the 1-in-12 barrel twist. I thought the 1-in-12 twist might not stabilise it, but it is a flat base bullet and in that rifle it was fine. 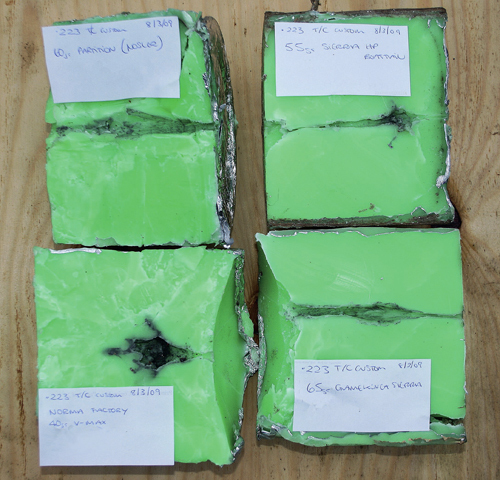 It gave an initial 1in depth penetration before expanding to 0.518in diameter and penetrated a maximum 6in with a large 0.75in-wide by 2in-long wound cavity. The Sierra 65-grain GameKing with a soft nose profile was just stable in the 1-in-12 twist barrel at 2,851fps and stable in the 1-in-8 twist .22 Satan barrel at 3,577fps velocity. At the lower velocity there was 1.25in of initial penetration and then a controlled expansion to 0.405in with a 0.75in-wide and 2in-long wound cavity. Good final bullet retention at 56.8 grains makes this bullet a confident performer. A bigger wound cavity would be better and the higher velocity .22 Satan round at 3,577fps gave a final bullet diameter of 0.497in, but only 33.9 grains weight retention. However, the wound cavity was superb at 1.5in wide by at least 5in long with a total penetration of 7in – a very useable performance. The Speer 70-grain bullet would not stabilise in the 1-in-12 twist barrel, but from the 1-in-9 twist RPA barrel produced 2,826fps with an initial 0.75in penetration followed by a 0.5in-wide and 2in-long wound cavity and 7in total penetration. The bullet expanded to only 0.365in, hence the smaller cavity, but the recovered bullet was only 45.5 grains and most of the lead core was found in the test medium. This is a good bullet that produces a small wound but sheds a lot of energy within the vitals. The last to be tested was the 75-grain Swift Scirocco, which is designed specially as a game bullet. Its polymer tip, boat tail and large bearing surface all looked good, but even in the 1-in-9 twist RPA it proved unstable. It is a long bullet. Heavy bullets do not stabilise in slow-twist barrels, as these 75-grain Scirocco bullets show. In the 1-in-12 T/C, they went sideways. At the lower velocity of 2,746fps there was 1in of initial penetration, then a 0.5in-wide wound cavity for the rest of the 6in depth because the bullet expanded to 0.522in diameter and it kept all its weight, plus some media embedded. It was a nice controlled bullet, but one that would work better at a higher velocity. I loaded it in the .22 Satan at a blistering 3,422fps velocity and it was stable. 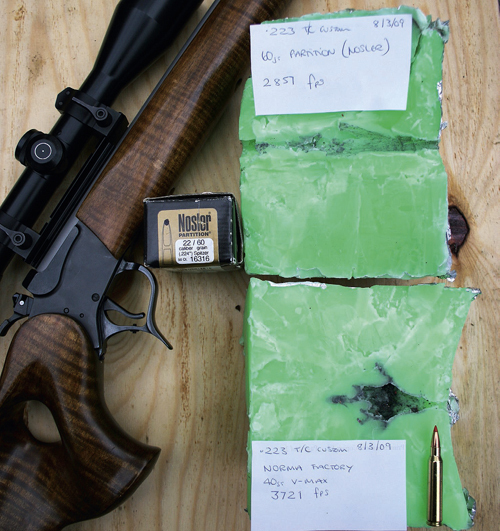 Though it expanded less to 0.503in diameter and after penetration only weighed 64.4 grains, the wound cavity was 1.45in wide and more than 5in long – it actually blew the end of the test media apart. This is a superb, tough, energy-releasing bullet if your rifle can shoot it accurately with the right twist rate. The results hopefully are of use and interest as I plan to conduct another series of tests using the same method for vermin and fox bullets, and normal deer bullets. 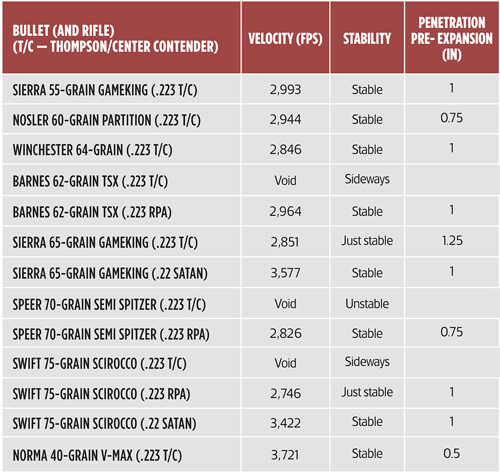 I have chosen some of the better bullets from each category and tested them at differing velocities to simulate how particular bullets perform at the different ranges at which most game is harvested. Before using heavier bullets, check that your rifle?s barrel twist rate will stabilise them and that they achieve legal velocity and energy levels. I hope this shows that with a bit of careful thought and prudent bullet choice you have a selection of .22 centrefire bullets that are more than capable of humanely taking small deer species as long as you put the bullet in the right place to begin with. Some say this is why larger calibres are best as there is less margin of error. Well, sorry, the smaller calibres recoil less and are therefore intrinsically more accurate. I prefer a carcass that has not been damaged by an inappropriate larger calibre that was used just in case the shot missed the vital organs.